It had been a good trip to and from the Twin Cities, ornithologically speaking. We saw seven bald eagles and a dozen turkeys, along with many dozen great blue herons at their rookery on the bank of the Snake River near Pine City. But the best came last as we were returning home and nearing Duluth. We had just crested the north shore of Glacial Lake Duluth on Highway 23 and were beginning our descent to the St. Louis River when Mary saw four swans heading downstream, flapping their wings and shimmering against the gray and overcast sky. On their northward migration in spring, swans usually stop over for several weeks where the St. Louis River empties into western Lake Superior, but this year the swans have been around an unusually long time. We saw our first swan on February 20, flying north and low near the campus, and Mary saw a pair on March 20. We saw these four swans on April 8. There are two species of swans in North America, trumpeter swans (Cygnus buccinator) and tundra swans (Cygnus columbianus). Tundras have a yellow spot at the base of their bill, but the bill of trumpeters is all black. Tundras are slightly smaller than trumpeters, averaging 14-16 lbs with 6-7 ft. wingspan compared to the trumpeters’ 15-30 lbs and a wingspan that can range up to 8 ft. We were too far away to see whether these swans had the yellow spot at the base of their bill, but these seemed a bit small for trumpeters, even allowing for their distance, and they were not near the trumpeters’ nesting grounds in lakes with large beds of nutritious wild rice west of Duluth. Most likely, they were tundra swans on their way to the vast labyrinth of sloughs, islands, and wetlands of the delta of the Mackenzie River where it empties into the Beaufort Sea in the Canadian Arctic. They were going there to breed. The Arctic is several thousand miles from the wintering grounds of swans. The breeding season in the Arctic, encompassing egg laying through rearing the young, is short – 3 months at most. The swans and their newly fledged young must then turn south and begin their migrations to the wintering grounds. The long distance to the Arctic summer grounds and the short breeding season there make huge energy demands over a short period of time for swans and other arctic shorebirds such as sandpipers and their relatives. How do swans and other arctic migrants contend with these energy demands? One way is to get to the breeding grounds quickly and forage on nutritious spring shoots of plants before laying eggs. Birds that employ this strategy are known as income breeders because they use the energy income on their breeding grounds to fuel egg laying. The opposite strategy is to carry enough energy reserves with them from their wintering grounds to the breeding grounds and begin to lay eggs immediately upon arrival. These birds are known as capital breeders because they depend on the capital reserves of energy in their fat for egg laying. Income breeders are in better condition once they begin to lay eggs but have a shorter breeding season to hatch the eggs and rear their young before heading south. Capital breeders have a longer breeding season but begin it in poorer condition; their energy reserves are replenished later during the span of the Arctic summer. There is, therefore, a tradeoff between the length of the breeding season in the Arctic and the condition of the bird at the start of it. Each breeding strategy solves the problem of the bird’s energy budget by how it balances this tradeoff. Which one is successful depends on the pace of the northward advance of spring. The four swans we saw were beginning to cope with this tradeoff. In mid-March, they were on their wintering grounds in Chesapeake Bay and three thousand miles of hard migration to the Mackenzie Delta lay before them. Duluth lies one-third of the way along this route. As they migrate north, the swans follow the freezing level, a line which connects all points with average daily temperatures of 0⁰ C, as it sweeps north across the continent. South of this line, the ice has gone out of the lakes as the warm air masses from the Gulf of Mexico start to push north. In March and early April, most northern lakes still have almost complete ice cover because the region remains under polar air masses. But the strong current of the St. Louis River has kept its estuary free of ice since late February, and the sloughs and wetlands here form a welcome staging area for swans before they continue the rest of the journey. Between Chesapeake Bay and Lake Superior, the swans have been migrating at a rate of 60 kilometers per day, comparable to the northward advancement of the freezing level in March and April. From here, they will head northwest along the border of the boreal forest and the northern prairies at a slower pace of 40 kilometers per day, pacing themselves according to the slower northward advancement of ice-out as polar air masses retreat northward. In mid-May, they will reach the northern edge of the Canadian boreal forest near Great Slave Lake, the headwaters of the Mackenzie River. By this time in the Earth’s orbit, the northern hemisphere is tilting strongly towards the sun and we are closer to the summer solstice than the spring equinox. Spring is advancing rapidly northward and green shoots are emerging in the thawing meadows and ponds. When they reach Great Slave Lake, tundra swans swing almost due north down the river to the delta, sprinting the rest of the way at a relatively blistering pace of 100 kilometers per day. This rapid pace gives an early arrival on their breeding grounds, allowing them to replenish their depleted energy stores by grazing on the aquatic plants emerging in the warming sun before they begin to lay eggs. Tundra swans migrating along two other flyways – along the Pacific coasts of North America and Asia – also sprint north on the last leg of their migration to Alaska and arctic Russia. Arriving there they, too, replenish depleted energy stores by grazing emerging aquatic plants before laying eggs. There is a fourth flyway for swans, from their wintering grounds in Great Britain through the Baltic to the arctic coast of Russia. The tundra swans migrating along this flyway are a subspecies known as Bewick’s swans. These swans have large gaudy patches of yellow at the base of their bills, unlike the more discrete patches of swans on the other flyways. These patches are distinct for each individual: at the Slimbridge Wildfowl Trust on the estuary of the Severn River in Gloucestershire, Peter Scott, a renowned naturalist and artist and Slimbridge’s founder, has recorded the bill patterns of over 3,700 Bewick’s swans (see watercolor paintings on pages 40-41 in his classic Observations of Wildlife). These idiosyncratic yellow patches help mates identify each other and the young recognize their parents. This keeps Bewick’s swans from breeding with tundra swans arriving on the summer grounds from other flyways. 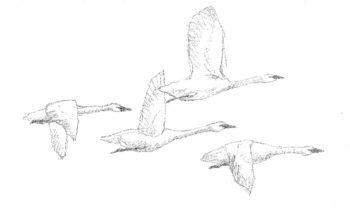 The northward sweep of spring along the Britain-Russian flyway proceeds at a slower pace than along the other three, so Bewick’s swans arrive later on their breeding grounds. Bewick’s swans cannot afford to shorten the breeding season further by spending additional weeks grazing before laying eggs. Instead, they must nest and lay eggs as soon as they arrive, burning much of the remaining capital of energy they have accumulated on their wintering grounds in the British Isles. Swans migrating along the Great Britain-western Siberia flyway are “capital” breeders. The tilting of the Northern Hemisphere towards the sun after the spring equinox warms the polar latitudes, but spring advances at different tempos in different regions. The northward migration of tundra swans everywhere is synchronized with the advancement of spring and the melting of ice on lakes along their flyways. But regional variation in the northward march of spring results in different breeding strategies by different swan populations. The swans possessing each of these migrating and breeding strategies are the descendants of those that have survived the gauntlet of natural selection for one breeding strategy or the other over at least several generations. If there are genes that partly determine whether an individual is an income breeder or a capital breeder, then the genes for the behavior that yielded the most offspring would have been passed down, generation to generation, until that breeding strategy dominated the population. If so, are these populations reproductively isolated according to their breeding behaviors? The later arrival of Bewick’s swans on the breeding grounds in Arctic Russia might prevent mating with the earlier arriving income breeders from the Asian Pacific coast. Capital and income breeding populations might therefore be the nascent beginnings of two new species. Within a few minutes of seeing the four swans, we drove onto the bridge over the St. Louis River. Downriver, the four swans were wheeling to their left, following the bend of the river on its last reach before entering its estuary at the western arm of Lake Superior. A few days later, I saw my last swans of this spring, two immature brownish-gray birds flying out of the mouth of the St. Louis River and turning northwestward over Lake Superior, heading to the Mackenzie Delta and the Beaufort Sea. Klaassen M., Abraham K.F., Jefferies R.L. & Vrtiska M. 2006. Factors affecting the site of investment, and the reliance on savings for arctic breeders: the capital-income dichotomy revisited. Ardea 94: 371–384. Nolet B.A. 2006. Speed of spring migration of Tundra Swans Cygnus columbianus in accordance with income or capital breeding strategy? Ardea 94: 579–591. Scott, Peter. 1980. Observations of Wildlife. Phaidon Press, Oxford. Next Next post: When did Darwin become a scientist?